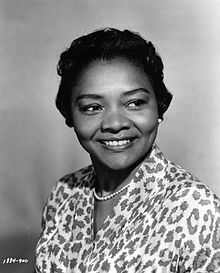 Juanita Moore (October 19, 1914 – January 1, 2014) was an American film, television, and stage actress. She was the fifth African American to be nominated for an Academy Award in any category, and the third in the Supporting Actress category at a time when only a single African American, Hattie McDaniel in Gone with the Wind (1939), had won an Oscar. Her most famous role was as Annie Johnson in the movie Imitation of Life (1959). Juanita Moore was born in Greenwood, Mississippi, the daughter of Ella (née Dunn) and Harrison Moore. She had seven siblings, (six sisters and one brother). Her family moved in the Great Migration to Los Angeles, where she was raised. Moore first performed as a dancer, part of a chorus girl at the Cotton Club before becoming a film extra while working in theater. After making her film debut in Pinky (1949), Moore had a number of bit parts and supporting roles in motion pictures through the 1950s and 1960s. Her role in the remake of Imitation of Life (1959) as African-American housekeeper Annie Johnson, whose daughter Sarah Jane (Susan Kohner) passes for white, won her a nomination for an Academy Award for Best Supporting Actress. She was also nominated for the Golden Globe Award for Best Supporting Actress in a Motion Picture for the role. When the two versions of Imitation of Life were released together on DVD (the earlier film was released in 1934), one of the bonus features was a new interview with Juanita Moore. She played the nanny Mercé in the 1970 remake of the 1948 Mexican film Little Black Angels. Moore continued to act for film and TV, with a role in the movie Disney's The Kid (2000), and guest-starring roles on television shows Dragnet, Adam-12, Marcus Welby, M.D., ER and Judging Amy. On April 23, 2010, a new print of Imitation of Life (1959) was screened at the Turner Classic Movies Film Festival in Los Angeles, an event to which both Moore and co-star Kohner were invited. After the screening, the two women appeared on stage for a question-and-answer session hosted by TCM's Robert Osborne. Moore and Kohner received standing ovations. Moore was married for 50 years to Charles Burris, who died in 2001. He was a Los Angeles bus driver and, although she was a frequent passenger, they met when she stepped out in front of his approaching bus. She was crossing the street to visit a local bar, hoping to find someone to study for the Inès Serrano role in the play No Exit—Serrano was a lesbian, and Moore was unsure how to play a lesbian. She and Burris married a few weeks later. Her grandson is actor/producer Kirk Kelley-Kahn, who is CEO/President of "Cambridge Players – Next Generation", a theatre troupe whose founding members included Moore, Esther Rolle, Helen Martin, Lynn Hamilton and Royce Wallace. Moore died at her home in Los Angeles on January 1, 2014, from natural causes. She was 99 years old. She is buried at Inglewood Park Cemetery. ^ Staggs, Sam. Born to Be Hurt: The Untold Story of Imitation of Life. Wikimedia Commons has media related to Juanita Moore. This page was last edited on 22 March 2019, at 00:59 (UTC).